SURFSIDE BEACH, Texas - On the third trip of the 2013 summer season the Booby Trap Fishing Team headed out just over 100 miles offshore out of Surfside Marina, Texas in search of a record swordfish. 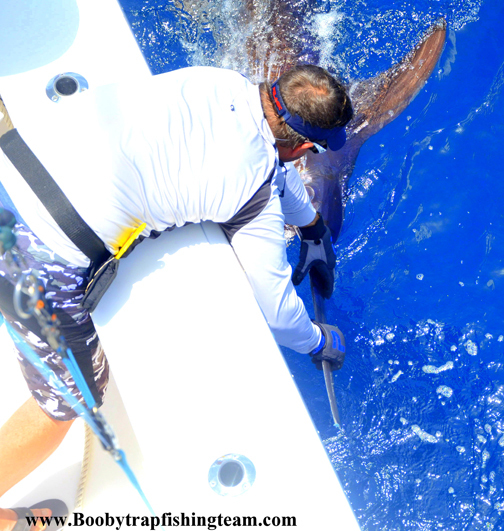 The team has caught to date over 800 swordfish and releases 95% of their catches, keeping only Swords that tend to look in rough shape after long battles. 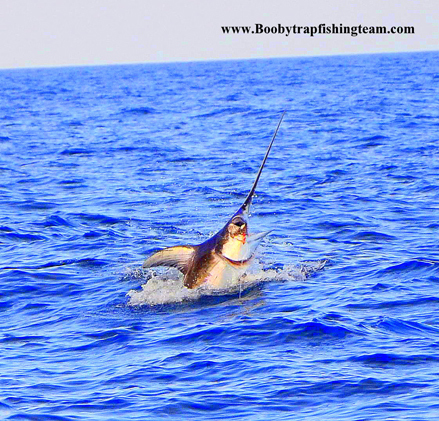 In the last 19 straight trips the Booby Trap has caught 218 swordfish and released approximately twenty state record-class swords. On this trip, the state record was the teams target... Not looking for high numbers of swordfish, but spend the trip targeting bigger ones. The trip prior (second trip of the season) produced a 425 lb. 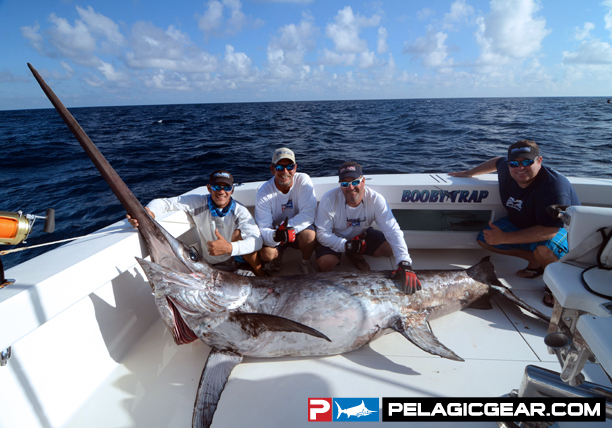 daytime swordfish caught by guest angler Mike Parson, which would have crushed the old record of 341 lbs . The sword was hooked deep and caught on the first day of that trip, so it was plugged and iced down for the 3-day trip still in search of a larger sword. 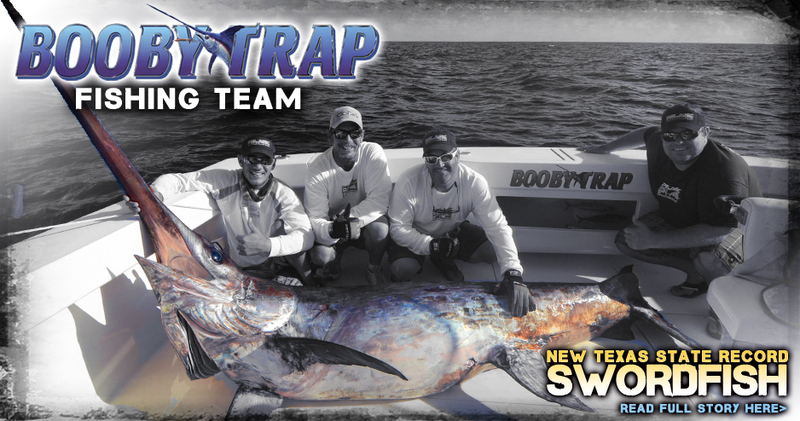 Below: Swordfish junkies - The Booby Trap Fishing team releases 95% of the swords they hook. Pelagic Pro Team Captain Brett Holden readies one of many swords caught to head back to the depths // Epic? 30 swordfish releases in 3 days' fishing. On June 2nd, Capt. Ahab/Brett Holden, Capt. Jeff Wilson, First Mate Matt Reed, Crewman Travis Joyce, and guest anglers Brian Barclay and Danny Lenderman headed to the sword grounds for some daytime swordfishing action. On the fourth drop and fourth strike of the trip, the rod took a strong dip then loaded up – angler Brain Barclay grabbed the rod and headed for the fighting chair. The big swordfish raced to the surface at first and then headed back down to the bottom at 1750 ft. and decided to stay there. After a 4 hour and 20 minute battle, the fish shot back to the surface and raced around behind the boat thrashing on the surface. Brett had already said he was sure the fish was over 300 lbs. and after seeing it on the surface thought may be over 400 lbs. Below: Large swordfish are known to sometimes skyrocket from the depths when hooked and put on quite an aerial displaying for making their charge back to the bottom. The crew then became clockwork! Brett had mentioned he wasn't taking in a sword to be weighed unless he figured it to be over 500 lbs. Seeing that the hook was deep and out of sight (down the fish’ hatch) the crew also knew this sword had swallowed the bait deep and would be the perfect opportunity to take in for the record. Brian pulled on the 80 Shimano Tiagra filled with 80 lb. Momoi orange diamond braid and the "Get Tight Sucka" Series Rod. The sword was wired by Capt. Ahab/Brett Holden as Capt. Jeff backed the boat up on the giant swordfish and Matt and Travis sunk the gaffs into her. Danny videoed the entire event of the catch and has since gone viral to over 500 networks around the Nation with thousands of forum and Facebook views (video embedded at bottom of page). The fish was weighed after 27 hours on ice and tipped the scales at a staggering 493 pounds. The giant sword was 108" long and had a 60" girth when measured aboard Booby Trap. By the time it was brought into Surfside Marina the next day, after being packed on 1000lbs of ice, it measured 107" long and had a 57" girth. 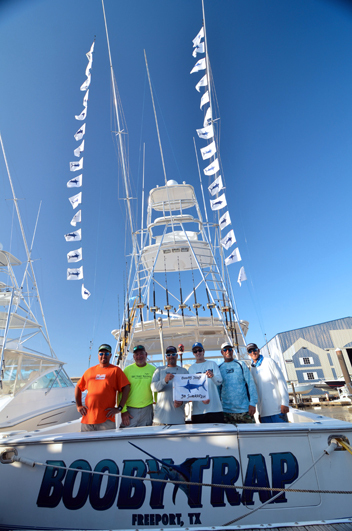 Below: The Booby Trap Fishing Team and their new Texas State Record Swordfish! On the same trip, Danny caught a sword that could have been twins with the record fish, but was instead released in great shape. Brett and Jeff said that out of all the swordfish they have tangled with here in Texas, this was the longest one they have caught, but probably not the heaviest. This sword was fairly skinny for its length and could have weighed as much as 700 lbs. at its 108” length. The 650 lb. sword that Capt. Brett caught in Florida was just 100" and the filets alone weighed 527 lbs., more than the entire weight of this entire fish. 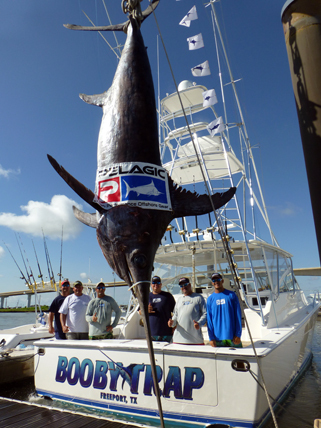 Still, what a catch – and record breaker – beating the old record by over 150 lbs. 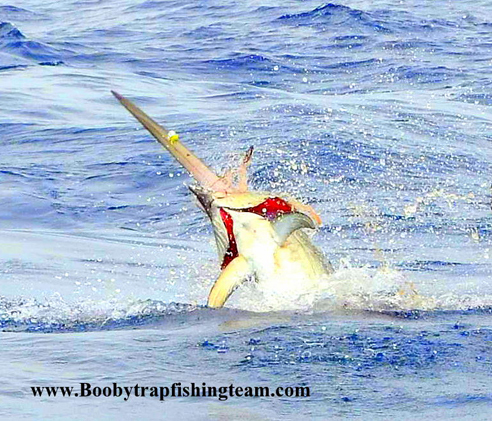 Below: A recap video that documents the epic trip aboard Booby Trap which produced double-digit swordfish catches/releases, including the Texas State Record, as well as a few blue marlin and wahoo "just for fun" on the way back in.